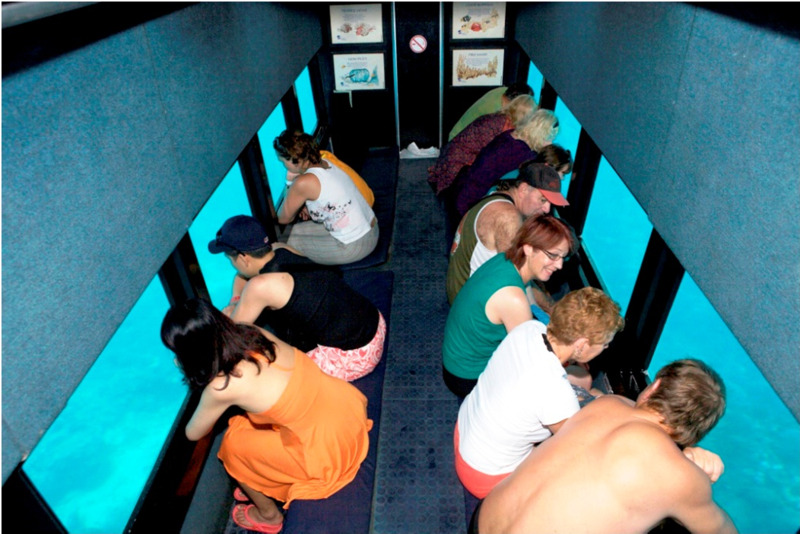 The highlight of this Bali adventure cruise is the sea walking session on the Bali Sea floor. 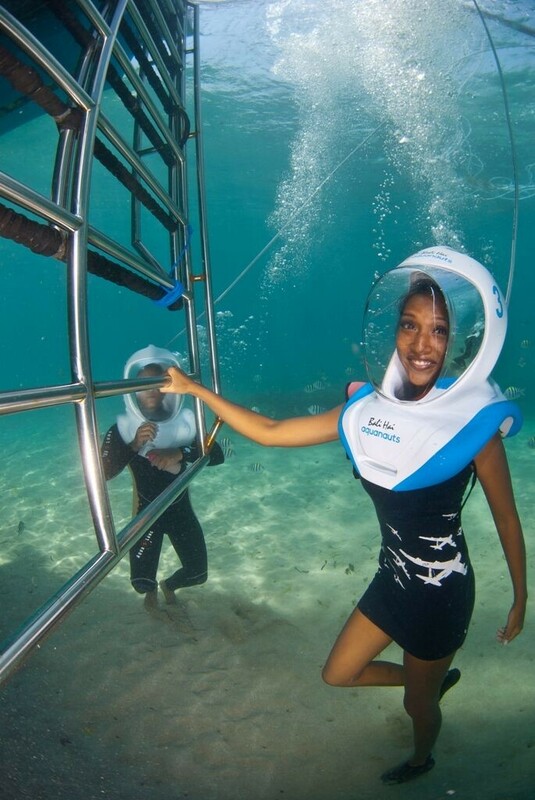 For 25-30 minutes, you'll dive down 15 feet underwater and experience the delight of walking on the soft and sandy Bali seabed. 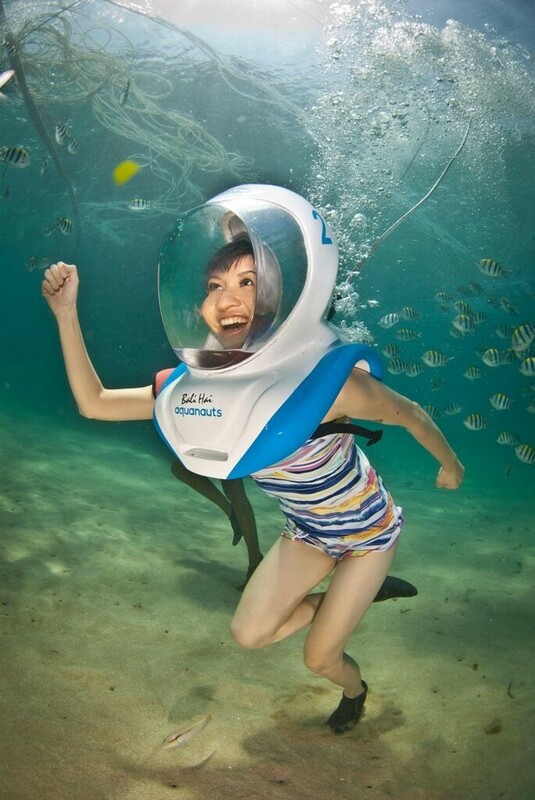 You'll be wearing a special helmet that will keep your face completely dry as you walk alongside small, brightly-coloured coral fishes like the famed Nemo clownfish, unicornfish, butterflyfish and many more. This reef cruise and sea walking in Bali adventure will also take you on a luxury cruise from the Benoa Harbour to Nusa Lembongan. 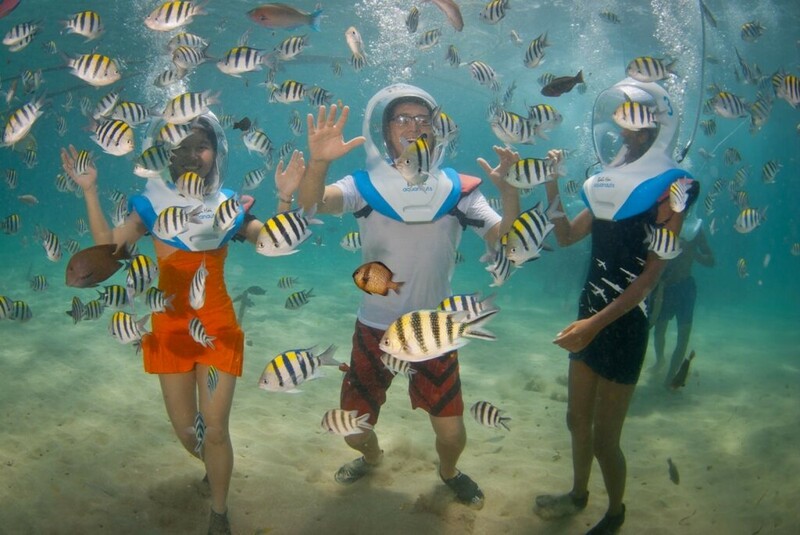 Here, you can go snorkelling and ocean kayaking, go on unlimited banana boat ride or visit the semi-submersible coral viewer. This is an ideal day adventure that is perfect for the whole family, or for a group of friends, with something for everyone to do. From the minute you board the cruise ship, there's so much to do that you won't know where to start. Starting from Benoa harbour, your luxury cruise catamaran will take you to the beautiful Nusa Lembongan island, in southeast Bali. Nusa Lembongan is known for its gorgeous white sandy beaches, rocky cliffs and blowholes, but most of all, for the rich marine life under the blue waters. You'll board a cruise and travel from the Benoa Harbour to Nusa Lembongan, where you'll spend the day participating in several different adventure activities. 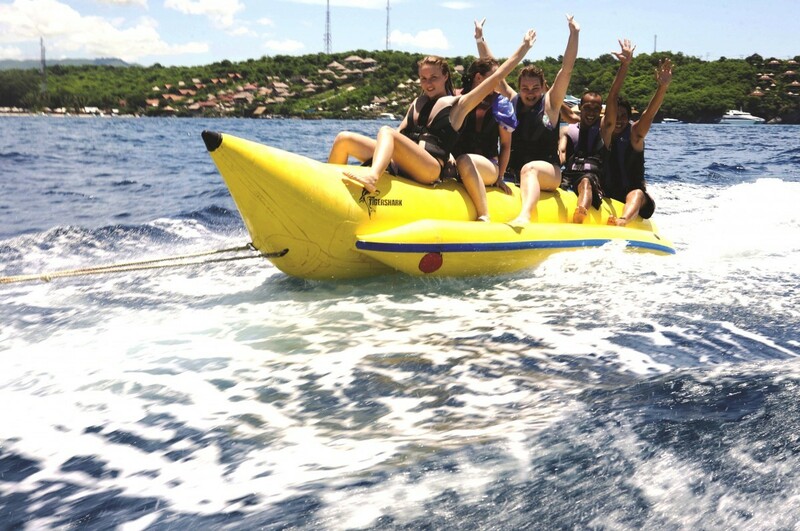 From sea walking on the Bali seabed to riding the long and yellow banana boat, you'll have a day of tropical fun. You'll also be served tea/coffee with snacks and a buffet lunch on board the cruise. The cruise departs from Nusa Lembongan around 15:15 hrs, and you'll be back at your hotel by evening. 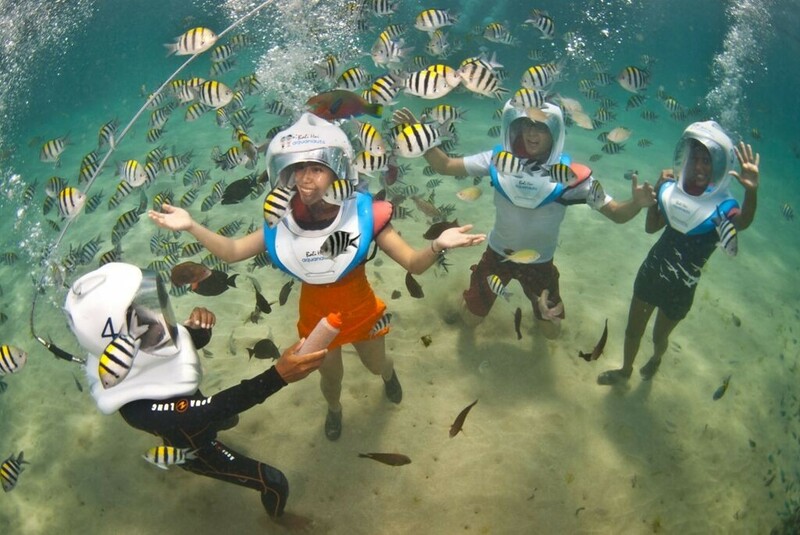 • Sign up for an exciting day of adventure on this reef cruise and sea walking trip in Bali. • Take a luxury cruise from the Benoa Harbour to Nusa Lembongan. 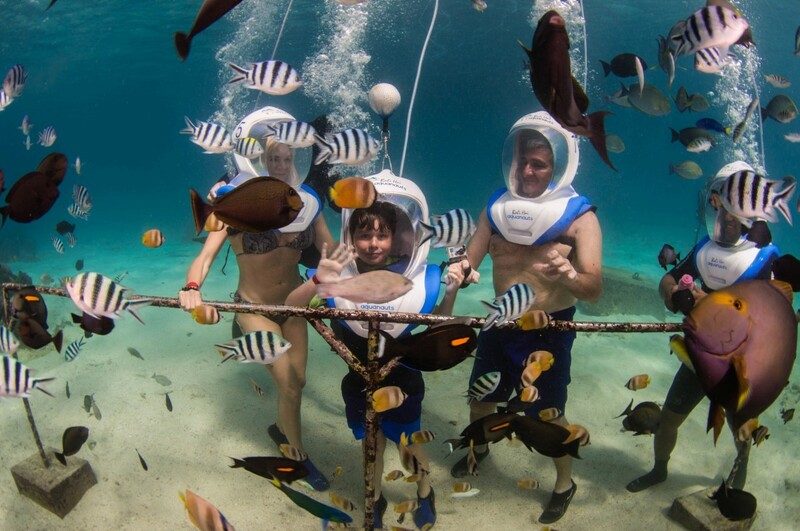 • Walk alongside Bali's rich marine life on a 15-feet deep sea walking session. 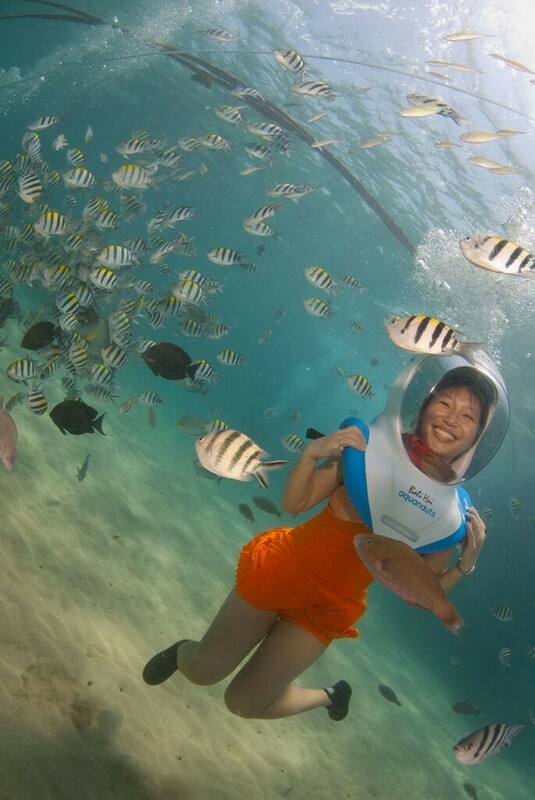 • Go snorkelling or kayaking to explore gorgeous, tropical waters of the Bali Sea. 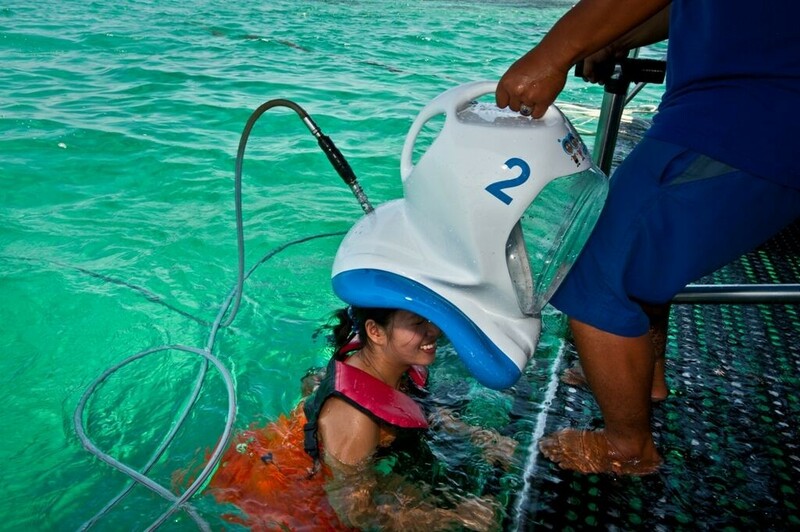 • Go on a semi-submersible coral viewer or take unlimited banana boat rides. Travellers are required to adhere to instructions of the dive instructor during the reef cruise and sea walking trip in Bali. Consumption of alcohol, drugs, tobacco products and cigarettes is strictly prohibited during the trip. For cancellations made 2 days or more before departure of the Bali reef cruise and sea walking trip: Full refund. 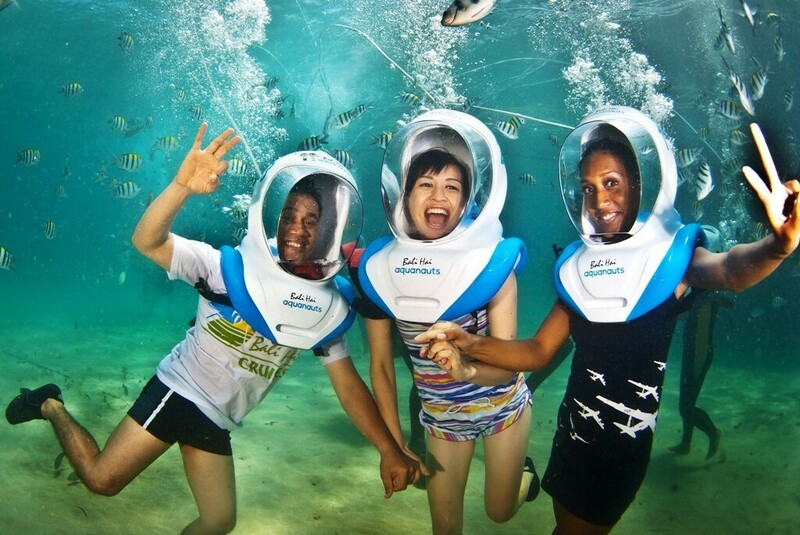 For cancellations made between 0-1 days before the departure of the Bali reef cruise and sea walking trip: No refund. All refunds will be processed after deducting any transaction charges. All refunds will be subject to a foreign currency exchange rate premium/discount. Children between the ages of 9 to 14 will be charged a discounted rate of INR 8,700. 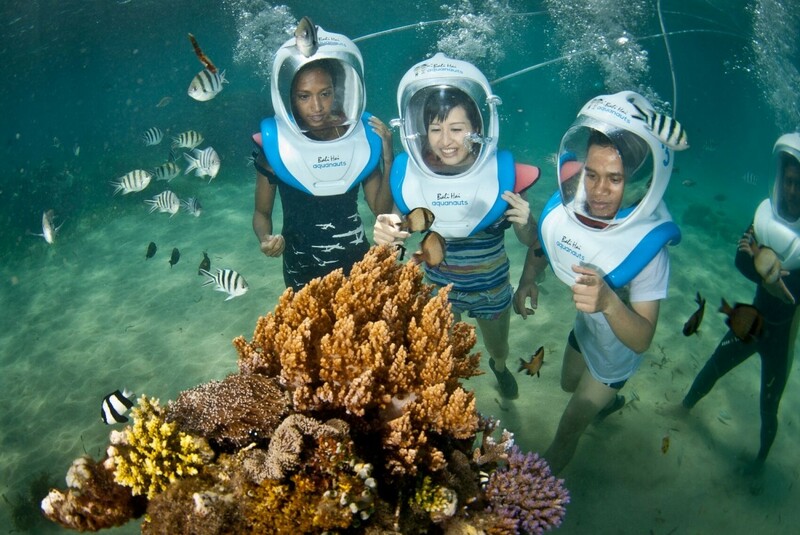 All travellers must complete a medical checklist before departing on the reef cruise and sea walking trip in Bali. Travellers who have in particular asthma, heart complaints, diabetes and/or are pregnant cannot participate unless given clearance from suitable physician. The exact pick-up and drop-off time may differ based on the location of your hotel. The tour operator reserves the right to change or cancel the itinerary of this reef cruise and sea walking trip in Bali due to bad weather conditions to ensure maximum safety of travellers and staff. In case of bad weather, the operator will reschedule the trip and will not be liable to pay a refund to any traveller. Prices mentioned may be subject to a foreign currency exchange rate premium/discount. 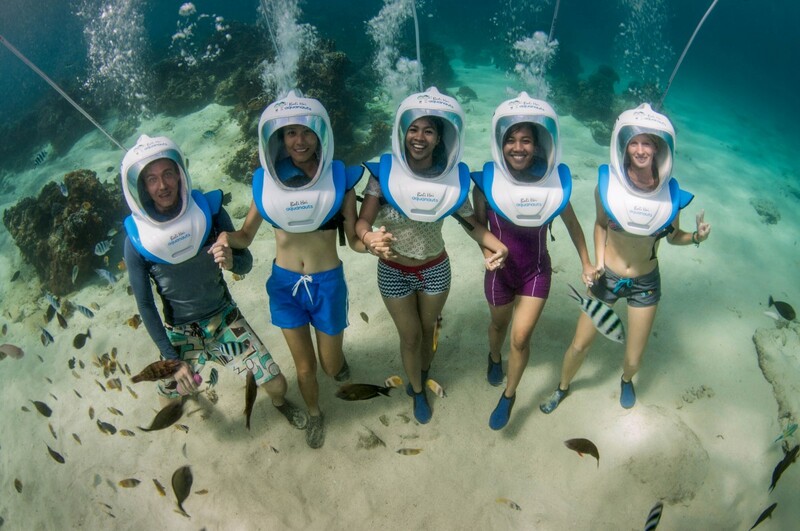 Go on a reef cruise and sea walking adventure in Bali! The pick-up schedule starts at 06:45 hrs, depending on your location. You'll be driven to Benoa Harbour, where you'll board the reef cruise. You'll be served tea/coffee and snacks as you sail towards Nusa Lembongan. The cruise docks beside a pontoon off the coast of Lembongan for the rest of the day, where you have a host of activities to choose from. 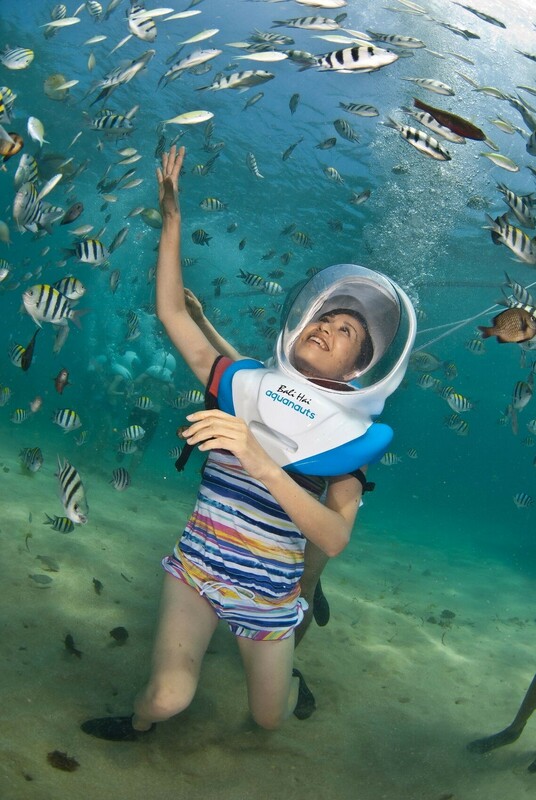 You'll go sea walking on the Bali seabed. 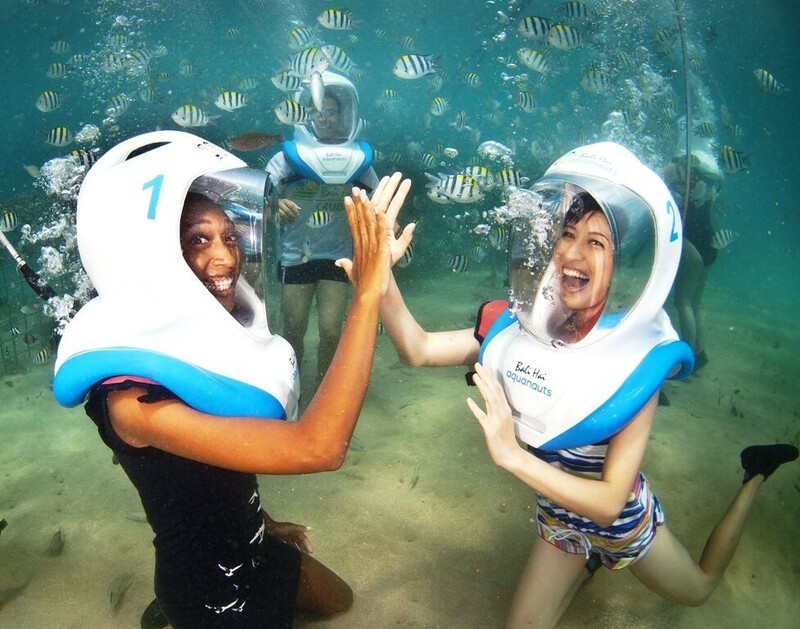 You can also participate in other water activities like snorkelling and banana boat rides. 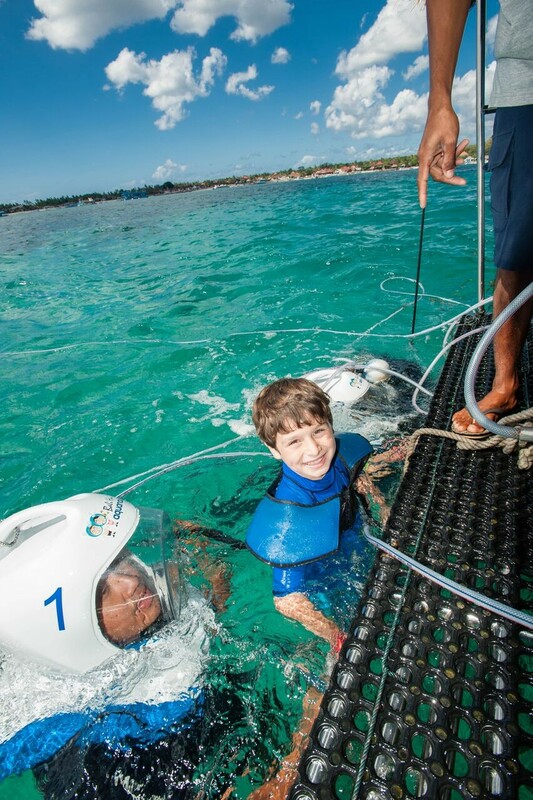 You can visit the semi-submersible coral viewer and go ocean kayaking as you enjoy a day of tropical fun. Once you've built up an appetite, you'll eat a big lunch, enjoying many options at the buffet spread. The cruise departs from Nusa Lembongan Island by 15:15 hrs. Relax and enjoy the stunning views of Bali. You should reach the harbour by 16:00 hrs and you'll be dropped off to your hotel by 17:00 hrs. Your trip ends here. 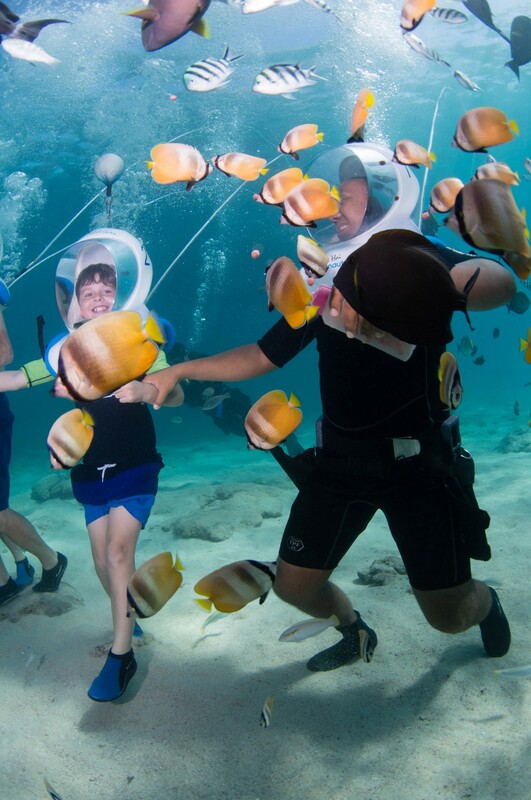 Swim alongside schools of small, coral fishes. Personal expenses like additional meals, beverages etc. You'll be picked up from your hotel and transferred to Benoa Harbour in AC vehicles. Travel between Benoa Harbour and Nusa Lembongan will be in a luxury cruise that departs at 09:15 hrs. You'll be served tea and snacks while you sail to Nusa Lembongan. 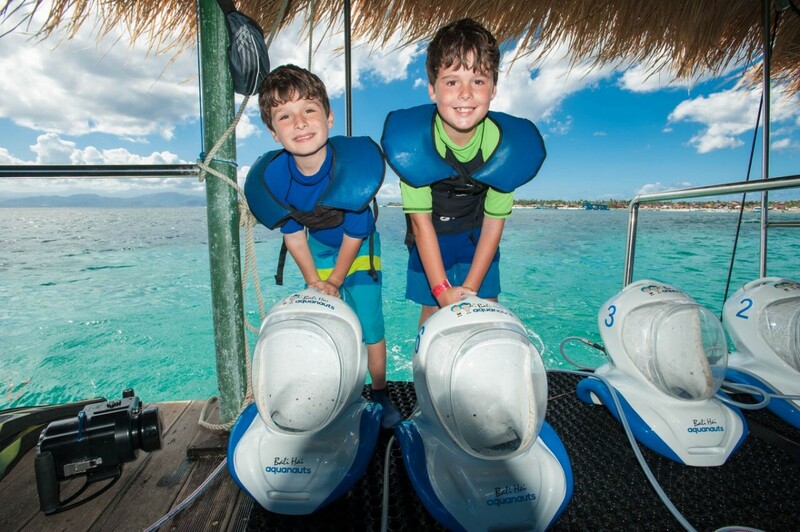 You'll spend the day participating in various adventure/water activities. In the afternoon, you'll enjoy a delicious buffet lunch. Transfers between your hotel in Bali to the Benoa Harbour will be arranged by the tour operator in private AC vehicles. Please inform the operator of your hotel address after your booking is confirmed. Pick-ups begin at 06:45 hrs, however, depending on the location of your hotel, the actual pick-up time may differ. If your hotel is one such hotel where a pick-up and drop-off facility is not offered, you may directly report to the Benoa Harbour, accessible via road in Bali. 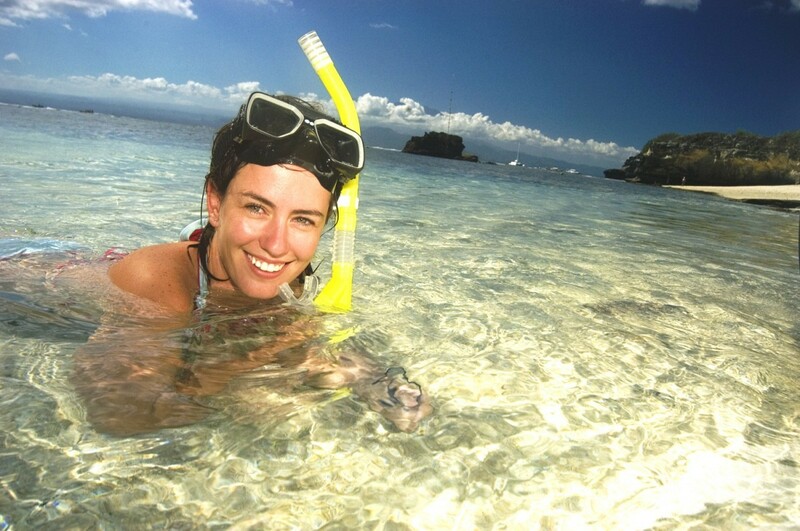 The tour operator will arrange your transport to the start point of the Bali reef cruise and sea walking trip.